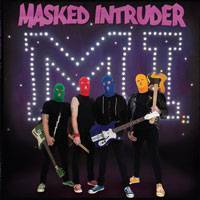 Reviews › Masked Intruder › M.I. I haven’t met a person yet who doesn’t like Masked Intruder, and I prefer to keep it that way. However, despite everyone being completely in love with them, they manage to still remain mysterious. I’m sure everyone has asked themselves these questions before about Masked Intruder: How long are they gonna keep up the gimmick? Are all their songs gonna be about chasing girls and going to prison? How many pairs of masks do they own in total? The last one is irrelevant, but their new full length M.I. helped to answer some of those questions we’ve all been wondering. First off, I never thought I’d be into songs about going on crime sprees and sticking up knives, but Masked Intruder have turned me into a crime lover. Gimmick or not, these guys have found something worth writing songs about and it actually works. Their music is far from basic in terms of gimmickry, in fact, M.I. has some of the catchiest songs I’ve heard in a while. “Crime Spree” is such an upbeat and catchy song that the guys in Masked Intruder could easily convince me to rob some banks with them. “When I Get Out” is a catchy as hell song about getting out of prison, which I didn’t think it could be done, but Masked Intruder have managed to make prison songs part of pop punk culture. “Almost Like We’re Already in Love” displays those amazing harmonies Masked Intruder are becoming known for; plus it has a reminiscent feel to the song “Wish You Were Mine”. “Hey Girl” is a song that in theory shouldn’t work because it’s essentially just the same line “Hey girl, what you doing to me?” repeated, but it manages to sound like a complete song in the end, rather than just filler material. That’s another thing about this record, even though some songs are short and sweet, they still have dynamic elements to them so none of the songs feel like filler tracks. “The Most Beautiful Girl” is a heartfelt song that every guy tries to write for a girl, only this is a song girls don’t pretend to like and actually want to hear. “Weirdo” is cool because the band acknowledges their creepiness, yet at the same time embraces it. Masked Intruder are like the underdogs that you’re rooting for, even if at the same time they are desperate for your love and want to steal your wallet. I mean, with a melodic ending song like “Locked Up and Lonely” how could you not fall for their endearing qualities? They might be criminals, but Masked Intruder are also some super, talented musicians and M.I. is total proof of this. Then a song like “I Fought the Law” is a reminder of how hilarious Masked Intruder are, which makes sense why it’s hard for anyone to dislike them. “I Don’t Wanna Say Goodbye To You Tonight” is a very fitting track because I don’t ever want to say goodbye to Masked Intruder. M.I. has not only managed to show the growth of the band, but it’s proved that gimmick or not, Masked Intruder have some serious potential as musicians. The dynamics and harmonies on M.I. make it a record I could listen to on repeat and not get sick of. And sure, they sing about crime and falling in love too easily, but it’s refreshing to hear songs that sound nothing like every other band out there. If you haven’t gotten into Masked Intruder yet, now is definitely the time because these guys can only continue to get better if M.I. is an indication of what they are capable of. Posted Sept. 22, 2014, 3:06 p.m.